Why a lance to the heart? Want to read the posts now? Go here. Want to know more about me? Go here. Or read on my brave friend! Do you ever have a nagging feeling about something? We use the word nagging because, well that’s just the way to say it. Often it isn’t nagging at all but more like persistant. For example if you leave the house and you just know you forgot something. You go back and discover that you left the water on, forgot your phone, left your briefcase, didn’t give the pets water…you get the idea. Have you ever had an “ah ha” moment? You know, that “light bulb just came on” kind of event. Well I get them all the time. It is like finding that one puzzle piece that has hidden from you for the last 5 hours. The difference is it isn’t about a puzzle at all. God wants us to know Him, know about Him, commune with Him, be dependent on Him, receive life from Him, receive wisdom from Him, receive provision from Him… He says if we lack wisdom we should ask for it and know we will receive it. So sometimes I have an “ah ha.” I usually call it a revelation. It isn’t “new un-included” information but clarity about something. You could call it a selah rhema that always points to the finished work of Jesus. This thought then becomes my “nagging” feeling (I don’t like that word, how about persistant prompting instead). So I have felt compelled and shared these thoughts with my friends and loved ones and now you. 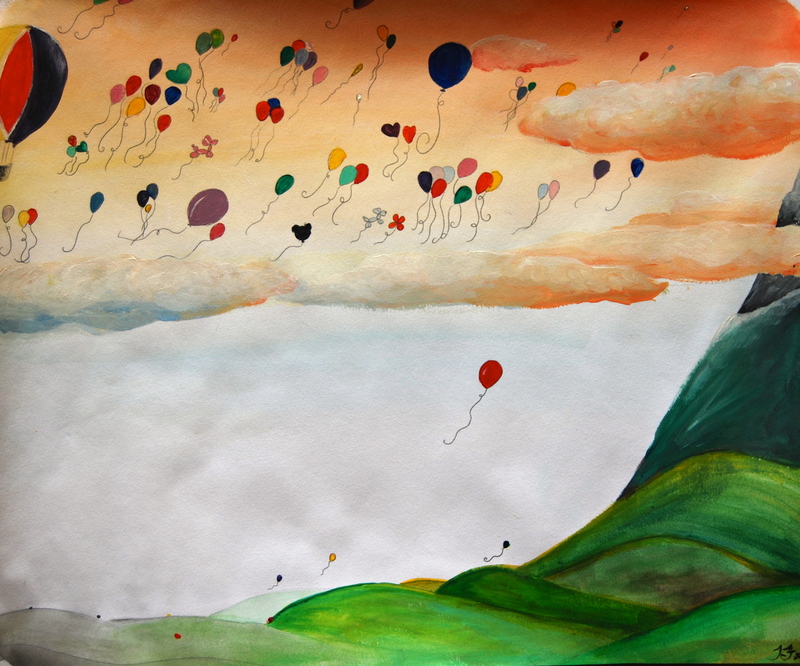 One morning I had this story in my head about balloons and what they were made for. This is a picture that my daughter painted based on the story. The amazing thing is I didn’t describe the image in my head but she captured it perfectly. So I believe it is a story that God gave both of us. I recommend you read the story here. I shared this story with the group and one of my dear friends said “you have to blog this! !” I had no clue what he was talking about, but after some persuasion, here we are. He even gave me the name for the site. So I hope everything I share is edifying, encouraging, brings understanding, brings clarity or most importantly brings a greater hunger to know your Daddy in Heaven. I pray that He will reveal His Son to you through the Holy Spirit as He has done for me.